Crude markets are catching a lift in early Monday trading, sending US WTI barrels upwards as energy traders look to reclaim the $49 level and $50 critical handle. US and China get set for trade talks on January 7th and 8th and investors are hoping for a successful takeaway from the negotiating table meeting, however, the important news came from OPEC+ for January, with production limits already beginning to take effect as exported oil from key OPEC nations helps to erase some of the oversupply especially from the overproducing United States. As expected, Crude prices climbed towards the purple trend line presented on the chart as bulls are set to reclaim back the $49 level. 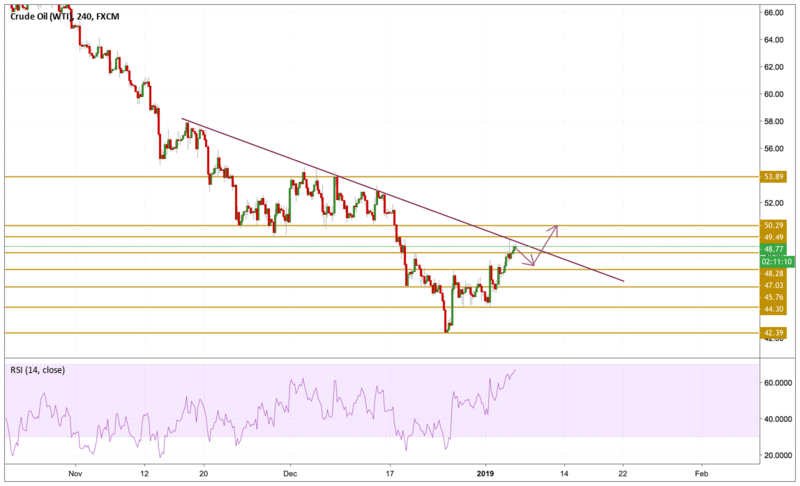 The price is currently hovering just below the trend line and above the $48.28 support level with overbought conditions knocking on the door. The combination of all the data above points towards the formation of a consolidation or a small correction before the price breaks higher and reverse the trend, that is why we will be focusing on the $50.3 level on the short term.